The Carwow awards held at the Shard, London, recognised the Alfa Romeo Stelvio as an award winning flagship SUV thanks to it’s dynamic performance produced by it’s 510p 2.9 Bi-Turbo V6 petrol engine. 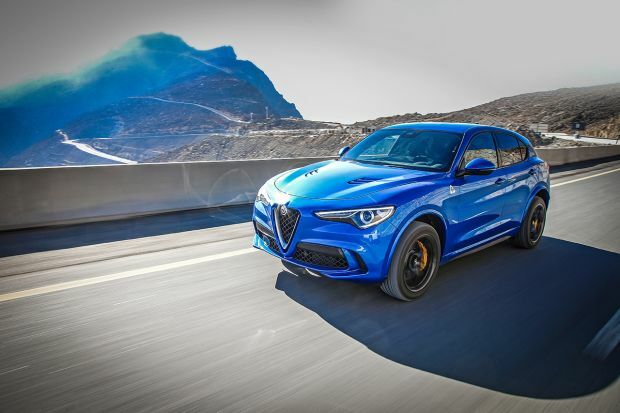 Carwow’s team of experts awarded Stelvio with the inaugural 'Driver's Award' saying it’s the most powerful Alfa Romeo SUV ever created for road use, ahead of some competition from other vehicle’s such as the Honda Civic Type R, as well as the Mazda MX-5. It’s powered by a 510hp, 2.9-litre Bi-Turbo V6 petrol engine. Has a top speed of 176mph. Goes from zero to 62mph in just 3.8 seconds. It features advanced technology designed to maximise dynamic performance, such as the Alfa Chassis Domain Control system, the Alfa N.A. Pro selector with Race mode and four wheel drive combined with AlfaTMactive torque vectoring. Innovative safety systems, including Forward Collision Warning, Autonomous Emergency Brake with pedestrian recognition and Lane Departure which come as standard throughout the range. Awarded a prestigious Five Star Euro NCAP rating. "While the Alfa Romeo Stelvio Quadrifoglio may not be the first performance SUV, it's easily the most fun - in fact it's more of a laugh to drive than most other pure sports cars and that's why it wins the carwow Driver's Award. It's a true have your cake and eat it car!" commented the Carwow judging panel. Sales and marketing director for Alfa Romeo, Andrew Tracey also comments: "To be recognised by the carwow awards is a huge achievement for Alfa Romeo and is testimony to the passion and dedication that went into building a beautiful sports SUV with outstanding performance. The Alfa Romeo Stelvio Quadrifoglio has just gone on sale in the UK so picking up this converted prize marks an amazing start to its story".